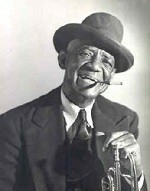 Bunk Johnson was a Jazz musician who lived in New Iberia and is credited for teaching Louis Armstrong and other Jazz legends. Learn more about Bunk Johnson and his music in the historical collection hosted at the Iberia Parish Library's Main branch and visit his grave at St. Edward's Cemetery. Attend the Bunk Johnson Festival held annually.